In the wake of the terrible events this week in Paris, I think this is the perfect time to write something about this beautiful city. Because I believe in solidarity in the face of tragedy and horror. Because #JeSuisCharlie. 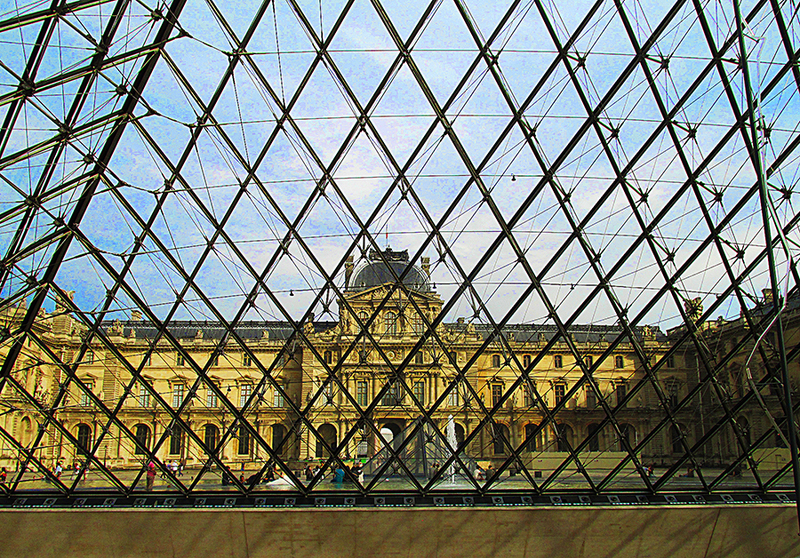 The Louvre Museum, seen from inside the I.M. Pei-designed glass pyramid in the central courtyard. My fear is that, faced with the reality of a terrible terrorist attack on Paris, on Parisians and on freedom of speech itself, some potential travelers to the wonderful “City of Light” will now decide to stay home. That happens so much whenever these terrorists act out their limited vision and hatred anywhere in the world. Logic gives way to irrational fear. People are made to feel vulnerable and they crawl into a shell to protect themselves. I just want to say this…and to say it very loudly: When we give in to fear, the terrorists win! Fear is their weapon of choice. When they use that weapon against us and we become afraid, i.e. we accept the ammunition they hand us, they win. Our fear is their victory! I refuse to be afraid of them. OK, enough about these losers with minds full of nothing but hatred and violence. They will never win, because we won’t let them. So let’s talk about something much more pleasant. Let’s talk about Paris! She is so beautiful, any time, any season, for any reason. 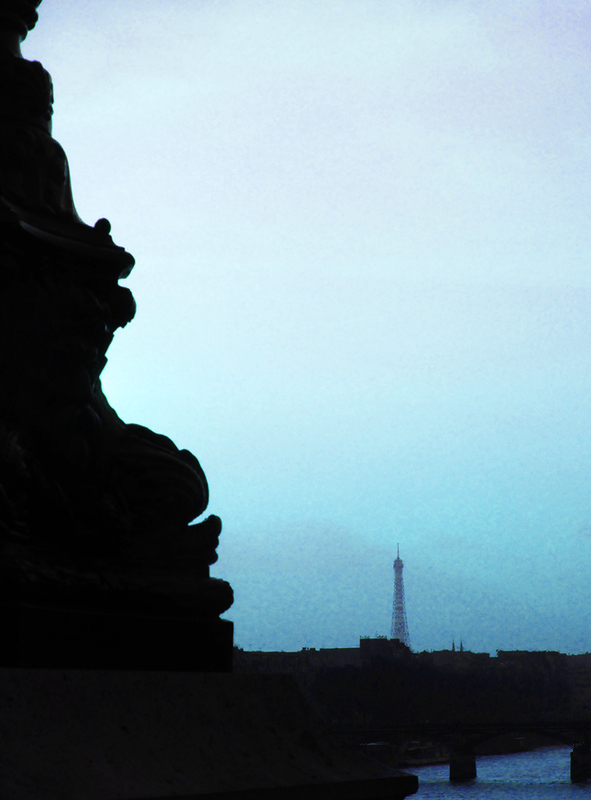 The Eiffel Tower is visible from most of Paris and is beautiful from up close or far away. I made my first visit to Paris when I was 25—a number of decades ago! I loved it then. I loved it on several subsequent visits. And I love it still. I spent a solo week in Paris in September of last year. I wish it could have been a month. I walked, I looked, I talked to people (a struggle with my very limited French), I ate. I walked some more. I ate some more! And it was all fabulous. This visit was quite different from that first trip as an eager and adventurous young woman. Back then, I ran from place to place, from museum to monument to not-to-be-missed site, my tattered copy of Europe on $5 a Day always at hand. I wanted see it all, do it all, taste it all. Now, I am more inclined toward what has come to be called “slow travel.” Maybe it’s age. Or perhaps it’s greater wisdom. Whatever, I took Paris slow, savoring each day and each moment, relaxing into the city at my own pace. Instead of choosing a hotel for this trip, I used AirBnB to book a tiny studio apartment for the week. It turned out to be cheaper than a hotel and much nicer than a hostel. I moved in, settled, slept till I woke, lingered over morning coffee in a local café, then set off to wander. I walked and walked and walked some more, barely getting the full value of the discounted one-week Metro pass I bought in advance of my trip. The slower pace meant I saw both less and more of Paris. I saw fewer monuments and museums and more people, fewer works of art on walls and more natural works of art in gardens and parks. I never hurried; I strolled. I stopped and just looked and breathed, tasted and smelled. As it turned out, it was absolutely the best way for me not just to “see” Paris but to experience her. 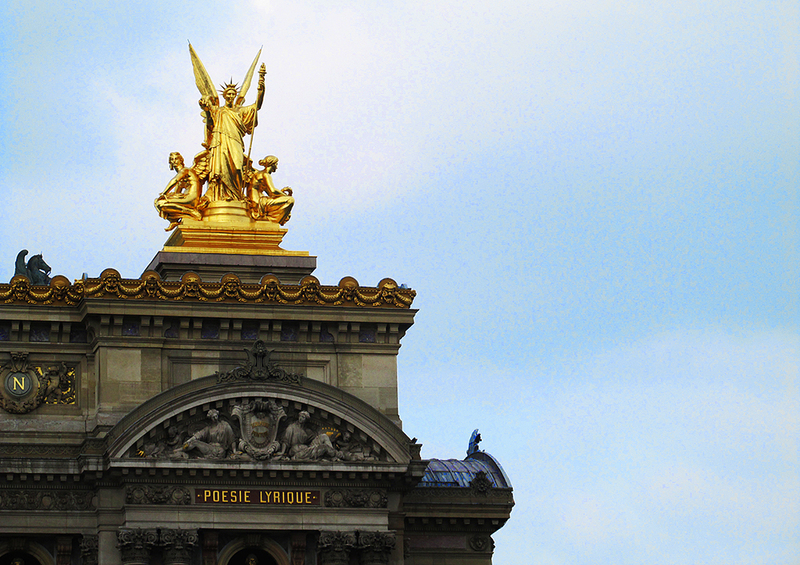 A golden statue glows against a blue Parisian sky at one corner of the Palais Garnier, home to the Paris Opéra until 1989. The company now uses this building mainly for ballet performances. My first day in Paris, I joined a volunteer from Paris Greeters for a free walking tour. They are offered in various parts of the city and always lead by volunteers who know the neighborhood well. My walking tour was in Montparnasse. My guide was Jean-Jacques, a retired teacher full of wisdom, humor and great stories. Often there are several people in the group, but this day I was the only one on his walk. We wandered at our own pace, stopped for coffee, stopped for photos, and simply had a lovely morning. Montparnasse is a neighborhood I had never explored before and I learned so much. Jean-Jacques was full of stories about the artists and writers who called this quartier home in the late-19th and early-20th centuries—after Montmartre became too chic and expensive for them! I saw where Degas painted, where Hemingway drank, where Mondrian loved. 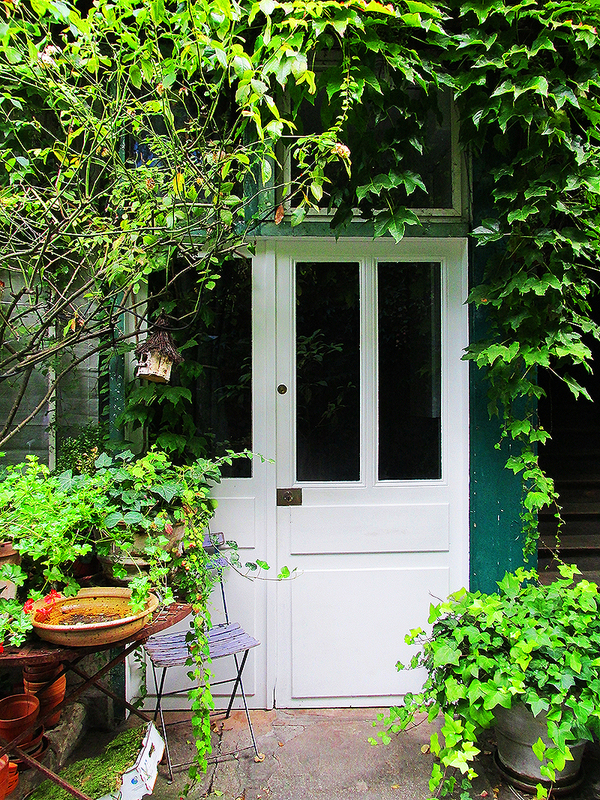 Entrance to an artist’s studio in a hidden courtyard in Montparnasse. I would never have known about it or found it without my Paris Greeters guide, Jean-Jacques. Degas had his studio in this very courtyard. 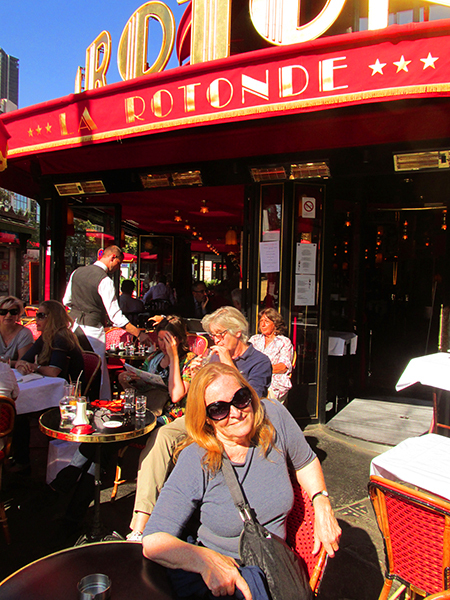 Enjoying sunshine and coffee at Cafe de la Rotonde in Montparnasse, a favorite hang-out of Picasso, Modigliani and Soutine, Apollinaire and Jean Cocteau, Hemingway, Henry Miller and F. Scott Fitzgerald, Debussy and the ballet dancer Nijinsky, among others. My main activity throughout my week in Paris was simply walking around this glorious city, often without much of a plan, seeing where my feet would take me. I spent a lot of time sitting in sidewalk cafés just watching the world go by. I wrote in my journal. I took pictures. I breathed in the special magic that is Paris. The studio apartment I rented was right in the center of the Ile St. Louis. Can you say… LOCATION?? You can’t get any more central in Paris. I fell in love with my neighborhood. There are tiny shops and patisseries and cafés everywhere. The famous Berthillón ice cream store was just around the corner… very dangerous! By my second visit to a neighborhood café or mini-supermarket, I was considered a local. Another thing that made the location so perfect was that no matter where I was headed, I passed Notre Dame on the way. I spent several hours wandering around the beautiful cathedral, inside and out, taking pictures and just feeling the ancient wonder of this glorious work of architecture and faith. 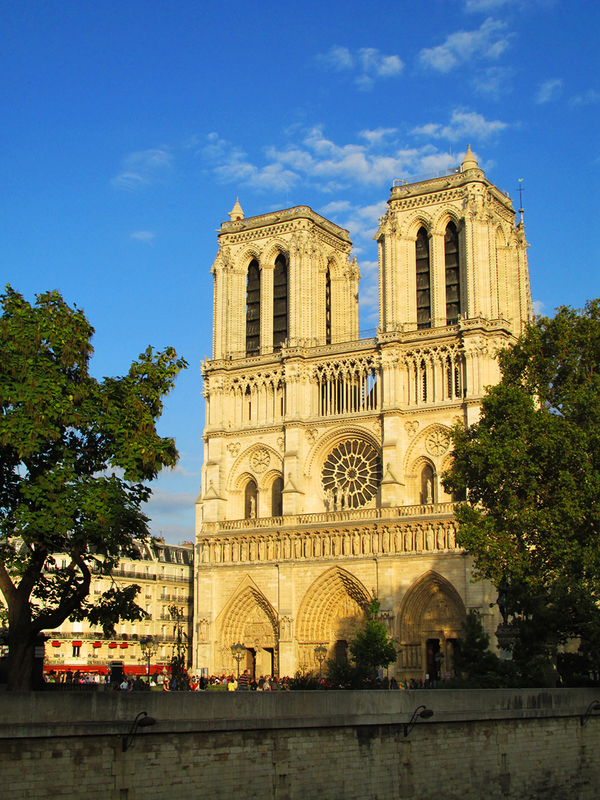 The main facade of the cathedral of Notre Dame de Paris glows in the “golden hour” of late afternoon against a blue Paris sky. 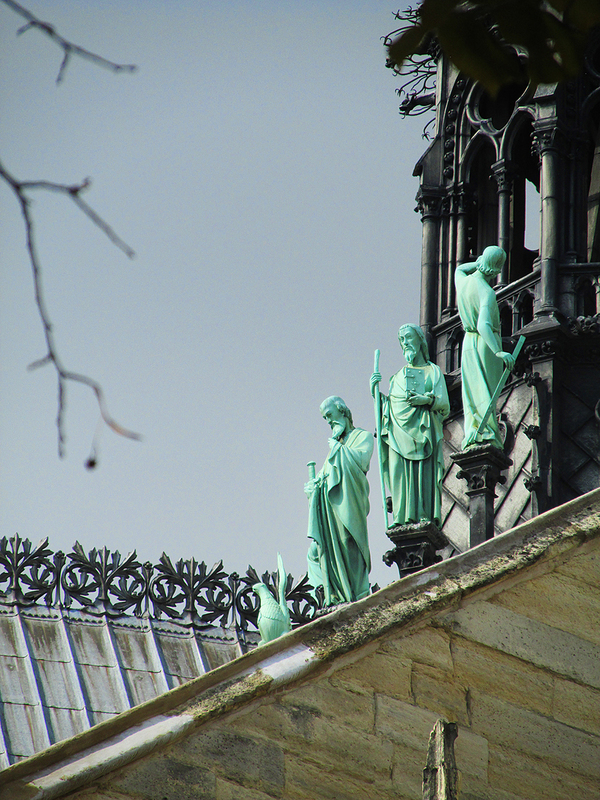 Statues of saints line the roof and high buttresses of the Cathedral of Notre Dame de Paris. 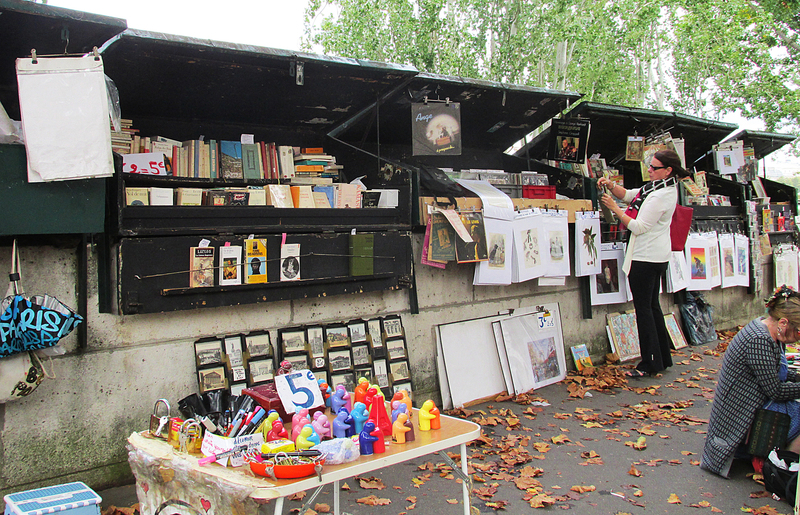 I spent much of one whole afternoon wandering from stall to stall of the book and print sellers along the banks of the Seine, mostly along the famous Rive Gauche, the Left Bank. And yes, my suitcase was noticeably heavier when I left than when I landed! will be calling your name… if you are like me. My “slow travel” schedule meant I passed on several of the iconic Parisian must-sees on this trip. I spent very little time in the Louvre, put off by the crowds and my own already tired feet. I never made it to the Champs-Elysées and the Arc de Triomphe. I did not get anywhere near the Eiffel Tower—although I did have some lovely views of it from all over the city. It is pretty hard to miss! I did make it to the Cluny Medieval Museum, in the heart of the Quartier Latin on the Left Bank. It is one of my favorite spots in Paris, and I spent more than an hour just sitting peacefully with the gorgeous tapestries in the “Lady and the Unicorn” series. It is basically impossible to capture the vibrancy and life in these centuries-old weavings in a photo—at least for me—but here is a taste. 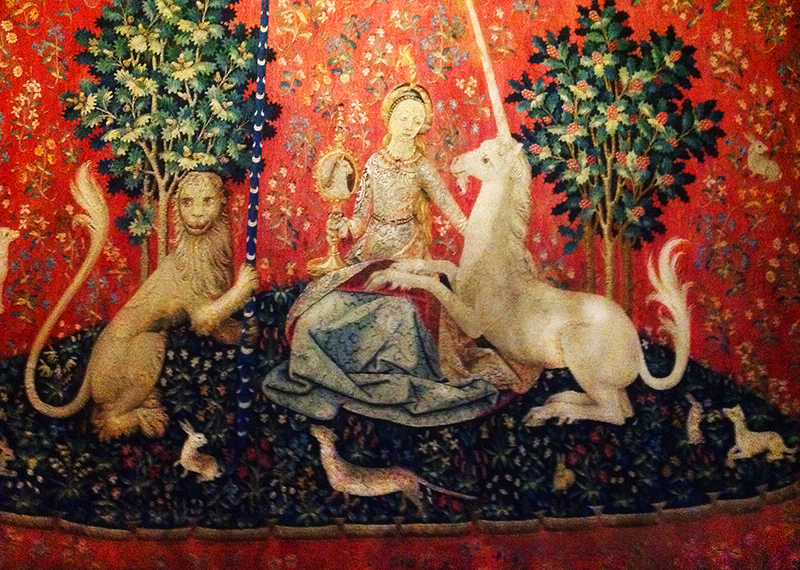 A detail of one of the famous “Lady and the Unicorn” tapestries from the middle ages. In the Musée de Cluny, Museum of the Middle Ages, in Paris. I was fortunate with the weather. Except for waiting out one short rain squall in a doorway crowded with a few other Parisians near the Opéra, the sun shone brilliantly, sparkling off the waters of the Seine and pulling my eye up to roof lines and chimney pots, sculptures and that ever-present view of the Eiffel Tower. I wandered through the Jardin de Luxembourg and the Park behind Notre Dame, snapping photos of flowers and lovers. What better place than Paris to photograph lovers? On my last day in Paris, she gave me a special gift… a perfectly Parisian sunset that set the Seine aglow, an apt image to remember her by. 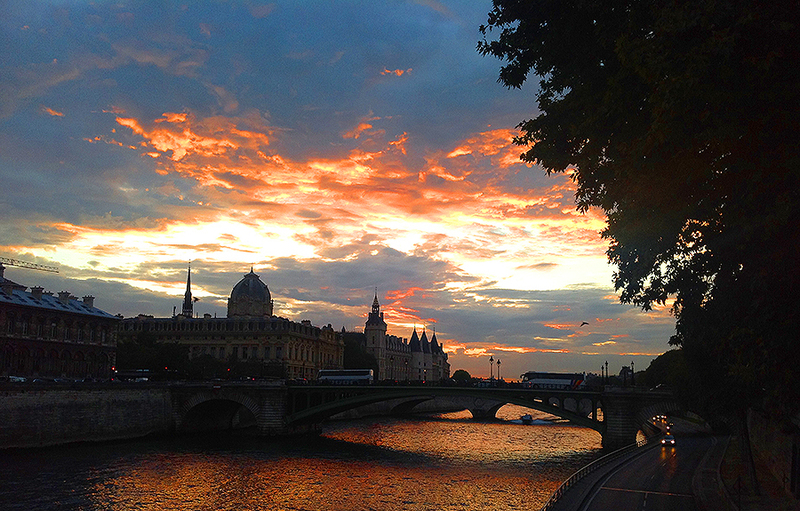 What could be more beautiful than Paris at sunset…? This was not my last visit to Paris, of that I was determined. In fact, I have already booked my return ticket, this time for the spring. Paris in April! What could be more perfect? What should I make it a point not to miss on my next trip to this golden, gorgeous, light-filled city? Tell me in the comments below. Looks like you had a great trip! I love Paris, so many amazing museums! i love Paris but haven’t been for so long, must get back! It really is a beautiful city, such a pity that the events of this week have bought so much fear and sadness. Agreed that you can’t let fear or the perpetrators of fear win. I’ve heard a lot of negative things about people not enjoying Paris.. seems like one you have to experience and find out for yourself. Of course, there will always be some people who “do not enjoy” Paris or any other place in the world. It comes with being human. And yes, like any other place in the world, you just have to experience it and find out for yourself how you feel about it. But my own experience is that not enjoying any place has more to do with one’s own attitude and current state of mind than anything else. If you are completely open to the idea that a foreign city or country is just that “foreign,’ and don’t expect it to be like “home,” but are prepared to appreciate and relish the differences rather than dislike them, you are much more likely to enjoy yourself. If your mind is set on enjoying a place, you generally will. If not, then not. Just my own experience. We will be travelling to Paris the 1st two weeks in July. My son has been attending Diderot University this past year. We will rent a house in Paris so we can make meals. Mom, dad, 25yr old, 22, and 15 can eat a lot. Looking for things to do off the beaten path. We are all artists and musicians. Any recommendations? Hi Pamela – Lucky you to have two whole weeks in Paris with family! And renting a house is a great solution for you. I have just rented an apartment for 5 days next month and am so excited about being back there again. I’m working on a new post about Paris right now, which will include some of my personal favorite OFTB spots and things to do in the city. It should be up in the next few days. Watch for it! So glad you’re having a great time! If you have time, try biking to Amsterdam! I can hook you up with a group who does this often. Cheers, Donna! I hate to be a naysayer but Paris is the one place I felt unwelcomed and just generally treated badly. I can appreciate it for the stunning architecture, art, and landmarks but that’s as far as my love affair goes with it. I hear over and over though how fabulous it is, and this post makes me think I need to give it 1 more try! Well, Mary, on the one hand, I would encourage you to give it that one more try. On the other, I will admit that no place in the world is going to be right for everyone. I live in what to me and most other people I know here think is paradise. But I also know people who will never come back to San Miguel and did not enjoy their visit here. If you do give it another chance, I’d suggest you go with no expectations or clear ideas of what you will see or how you will be treated. Just relax into Paris and let her show you her good side–maybe with one of those volunteer walking tour guides. Or not. There are certainly enough other spots in the world to explore so that you don’t have to go back to one you did not enjoy. I hope the next adventure is wonderful for you! Elaine recently posted…Visiting the set of Home and Away, Palm Beach, Sydney! I have a new friend who is going to Paris in April. She wants to do and see the non-touristy off-the-beaten-path sort of places, which you are so good at idenitfying. In addition to this lovely blog, could you suggest maybe 5-6 other fun adventuresome places to see, eat at, enjoy? I started to write a reply to you, Hope, but it got out of hand. It is turning into an entire blog post! I’ll put it up in the next 24 hours or so and post a link to it here. When it comes to Paris, apparently I have a LOT of suggestions! Watch for it. I finally visited Paris for my birthday in 2006. We got this fabulous room with a great view of the Eiffel Tower and I was just in love! I felt like I had this big dazzling birthday cake right out the window. I’d love to go back, but it looks like Spain and Colombia are further on top of the list right now. Definitely hitting up Belize again in March for a Chocolate Conference. And at some point, my husband and I plan on living in Italy for awhile. I have dual citizenship there, so once we are married for 2 years, he can also get it and then we can go live and work there without restriction. Thanks for sharing your Parisian journey!! Thanks for your comment, Ety. Spain and Colombia will be great to visit. Also Belize. And for a Chocolate Conference. Oh my!! Enjoy it. Paris will be there when you are ready to return. I would love to visit Paris again (the last time I went I was a child! ), are there any eateries you’d recommend that give a good French experience, without being too costly?